This is an often overlooked truism. Actually, it’s sad really, how this information is buried in unread scientific and medical journals. This could really help a lot of young people, who are considering growing a mustache, or even those that are considering hanging out, befriending, dating, or even fornicating with those that have moustaches. They are not to be trifled with. That are indeed the most important bodily hair. And, this isn’t meant to exclude women. Frida Kahlo anyone? Martha Stewart? Jennifer Aniston a week after her last bleaching? These are all powerful female moustache wearers, and where do we even begin with men: Rollie Fingers, Tom Selleck, the dude behind the bar at the Y Not, the hipster dude with the tight pants and tighter girlfriend. All influential in many ways on many lives. So, teach your children well. 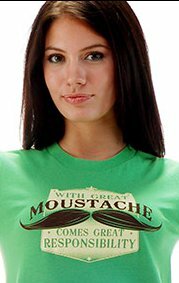 And, help spread the news to the general populace with the With Great Moustache Comes Great Responsibility T Shirt. To work at Snorg Tees, it’s mandatory that you wear a moustache at least six months of the year. It’s even integrated into their timeclock system. You look into your webcam and it connotes whether you hae the ‘stache or not. Some people have been saying this shirt has something to do with that vulgar moustahce rides meme, but I highly doubt that Snorg Tees would stoop to that level.